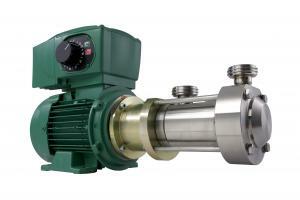 Lobe and piston pumps are traditionally favored in the food industry because of an easier hygienic maintenance and usage flexibility across various products. However, the high maintenance costs, low accuracy, poor volumetric consistency and significant product loss directed the food manufacturers to find a better alternative. An eccentric disc pump, operating on the eccentric movement principle – the disc placed inside a pump cylinder rotates, creating two distinct pumping chambers was found to be the most effective solution. The eccentric disc pump produces a regular flow rate with low pulsations, low cavitation, and limited slip or shear even when handling the most delicate products, such as whole strawberries in syrup. – Manufacturer of cookies was losing ca. 50 kg of white chocolate coating per week due to the cleaning the pump needed several times per month. They changed the lobe pump to eccentric disc pump, which resulted in trouble-free 24/7 operation for over two years (and counting). – Due to a poor volumetric consistency of an ECP pump, the sauce manufacturer was rejecting 15-20% of the pouches not meeting the pre-determined weight. Switching to Mouvex allowed the manufacturer save time and money by significantly reduce product losses. – Yogurt manufacturers were losing more than $100,000 in product per line per year. Eccentric disc Mouvex pump helped recover over 70% of the product thus significantly improved their bottom line. Mouvex pumps are valued by Australian manufacturers. This technology has been used for pumping chocolate, glucose, galactooligosaccharides (GOS), yogurt, cream, and sauces. Due to its flexibility, this technology may suit your need too. If you seek to improve your bottom line and achieve considerable product recovery, talk to us about this fascinating technology – Eccentric Disc Pump. Many times you would like to buy your pump system as a package fitted on a skid with gear motor and coupling. Hurll Nu-Way has the facility to design, select, manufacture and assemble pump packages for every fluid transfer application for the local industry. Please talk to us today for a quote. This entry was posted in Pumps. Bookmark the permalink.